That conclusion comes from an analysis of Hofmeister’s Monatsberichte – a monthly listing of music publications appearing in the German market, compiled by Leipzig music publisher Friedrich Hofmeister from 1829 onwards. The Monatsberichte up to the end of the nineteenth century are available as an online database, listing about a third of a million publications from over 36,000 composers. This article is about the British composers and their works that appear in Hofmeister’s listings. The difficulty with this question is that Hofmeister does not mention composers’ nationalities. He is also inconsistent in how he spells and formats names, so the challenge was to deduplicate Hofmeister’s list of composers, and then to match them to other sources to get information on nationality, dates and gender. Deduplication of the titles of works was not practical, but fortunately Hofmeister mentions an Opus number for a surprisingly high 60% of publications, so multiple editions of most individual works can be identified. It is also possible to use Hofmeister’s category headings to assign works to different genres and instrumental groupings, although there is some inconsistency in how these categories are applied. Other information listed includes the publisher, city of publication, and the price. This chart shows the total number of publications mentioned by Hofmeister each year. 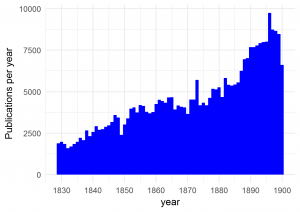 There are about a third of a million music publications in total, and their rate increases fourfold from about 2,000 a year in the 1830s, to 8,000 a year in the 1890s. Over half of the publications are of piano music, and another 20% are songs. Most of the listings are therefore what might be termed ‘popular music’ – piano pieces and songs for domestic performance, and arrangements of pieces from well-known operas or symphonies for a variety of instruments – including a bewildering variety of zithers, accordions, and members of the mandolin family. Looking at the breakdown by composer nationality (left), German composers have almost 60% of the market, and Austrians another 11% or so. They are followed by those from other neighbouring countries, and smaller shares from further afield. The German share increases from 50% to about 65% over the period, largely at the expense of the Austrians, French and Italians. Works by British composers comprise a very small part of the market – about 2% overall, and this does not change much over the period. Broken down by category, the Brits had about 2.8% of the market for piano music, and rather less than 2% for everything else, with just 0.8% for Choral music. The 1,000 or so British names comprised 3½% of the composers mentioned by Hofmeister, but they accounted for just 2% of published works. This reflects the fact (as shown by this chart), that the Brits were less productive, in terms of publications per composer, than other nationalities. In fact, they were at the bottom of the list, with an average of just over 6 publications per composer, compared to an overall figure of 13. The Austrians were top of the list with 39. 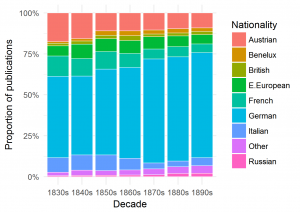 Remember that this analysis is only considering the German market, so this might simply reflect the fact that Germany was a less important market for British composers than it was for most of the rest of Europe. There were a few composers with huge numbers of publications. 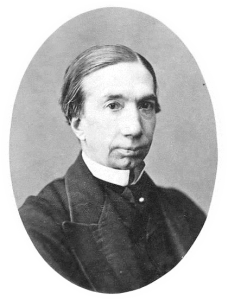 Henry Brinley Richards, the most published British composer in nineteenth-century Germany, had a total of 440 publications (all short piano pieces aimed at the domestic market). By comparison, the most published composers overall – Mozart and Beethoven – each had well over 3,000 publications listed by Hofmeister. Brinley Richards was in 65th place on the list. 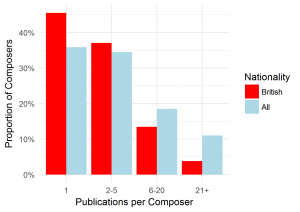 Not only did British composers have fewer publications than average, but so did their works. Again, the Brits were at the bottom of the table. Just 16% of British works received more than one publication in Germany, compared to 21% overall, suggesting that British works did not sell particularly well in the German market compared to other nationalities. Although Brinley Richards’ ‘Marie’ was published 34 times, that only took it to number 47 in the hit parade. The most published single work was another piano nocturne – ‘Les Cloches du Monastère’ Opus.54a by the Frenchman Louis Lefebure-Wély, which appeared 83 times from 1852 onwards.6 Weber’s ‘Introduction to the Dance’ was just behind with 82 publications – 65 of which were arrangements for piano. Beethoven’s most published work was his Septet, Opus.20, with 71 editions in various arrangements. 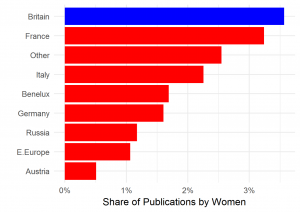 Almost 80% of the publications that crossed Hofmeister’s desk were from publishers registered in Germany, with another 10% or so from Austria. The big publishers dominated the market, with the top fifteen accounting for over a third of all publications. All of these were international businesses, with offices in several countries.7 Publishers based in Britain (all listed in London) accounted for less than ½% of the market, and many of these were simply the London offices of continental firms. Like everybody else, British composers selling in the German market tended to use German publishers – 81% of their works mentioned by Hofmeister were published in Germany, with less than 5% published in London. Almost 25% of works were published in Leipzig, where Hofmeister was based. Berlin accounted for 15%, and Vienna about 10%. Leipzig also accounted for a quarter of British publications, but in second place – with about 15% – was Mainz, home of the biggest publishers in the German market, Schott & Company. Schott seems to have been particularly keen on British composers, who accounted for about 5% of its publications in Germany. The company had an active branch in London from 1840 onwards, and was famous for its association with Beethoven, although I’m not sure why it was so attractive to British composers. A few of these are naturalised Brits of German or Italian descent. Several are Irish, such as Balfe, Wallace and Stanford (and John Field was just outside the top five in the Keyboard category). There are a few well-known names there, but a handful, such as ‘A Stolley’ and the two ‘Godfrey’s, I haven’t been able to identify. The boxes are arranged in decreasing order of the number of works. The top five in the ‘Keyboard’ box each had more than 170 publications, whereas John Lodge Ellerton only had to publish four works to reach the top five in the ‘Chamber’ category. We started this article with a piece by the most successful British male composer in nineteenth century Germany, and I’d like to finish with something by our most successful woman. I’d like to, but unfortunately I can’t. I can find no picture of her, no recordings, and no links to further information. The most published British female composer in nineteenth-century Germany was Charlotte M. E. Oliver, who had 39 publications mentioned by Hofmeister in the mid-1860s – mainly piano pieces but also a couple of songs and several marches and other works for orchestra. I have been able to find out very little about Charlotte Oliver. Some genealogical data suggests that she might have been Cornish, and I know she travelled to Germany at some point, but that is about it. There are a few holdings of her smaller pieces in the British Library and elsewhere, but no sign of the orchestral works that Hofmeister mentions. So, what can we learn from this analysis? Firstly, it is perhaps surprising that there were as many as 1,000 British composers selling into the German market in the nineteenth century, and a shame that so many of these have disappeared from our radar over the intervening period. Even the most successful ones, such as Henry Brinley Richards, are little known today. Secondly, although less surprisingly, the British enthusiasm for German music does not appear to have been reciprocated. It appears that, like everybody else, the Germans preferred German music, but also had time for the music of their neighbouring countries – France, Austria, Poland, the Czech Republic, etc.10 Composers from further away – Britain, Russia, Spain, even Italy – found it harder to crack the German market. Of course, by the same token, Germany was not as important a market to the British as it was to many other European composers. Thirdly, there are a few interesting patterns emerging from these figures that would merit further research. Why, for example, did Britain have a higher proportion of works by female composers in the German market than other countries? Why were Schott & Company apparently so favourably disposed to British composers? Finally, Hofmeister has shown itself to be a fascinating and rich dataset that lends itself to this sort of quantitative analysis. There are many other topics that could be investigated with this data – so this will not be the last article based on Hofmeister! However, it does require a lot of effort to extract the data in a useable form, to clean it up, and to cross-reference it to other sources. The online version of Hofmeister is a fantastic resource, but, as is often the case, it was not really designed to facilitate this sort of large-scale quantitative analysis. This is perhaps one reason why relatively few researchers have chosen to mine its rich seams. However, as this article has hopefully shown, there is much to learn about music history by taking a quantitative approach to the many large sources, like Hofmeister, that are increasingly becoming available. Cite this article as: Gustar, A.J. 'British Composers as seen by Hofmeister' in Statistics in Historical Musicology, 8th October 2017, https://www.musichistorystats.com/british-composers-as-seen-by-hofmeister/. This article is based on a presentation given at the Music in Nineteenth-Century Britain Conference at the University of Birmingham, 28–30 June 2017. You can hear a performance of ‘Marie’ on YouTube here. The sheet music can be downloaded from IMSLP here. These other sources included www.oxfordmusiconline.com, www.imslp.org, en.wikipedia.org, www.naxos.com, www.composers-classical-music.com, www.dolmetsch.com, and musiclassical.tripod.com. I applied a ‘random forest’ technique to predict nationality from consecutive pairs of letters in composers’ surnames. I may cover this in more detail in a future article. Nationality, of course, is often difficult to pin down, and for many individuals there is some ambiguity. I have gone with the majority opinion of the other sources. Although some individuals will have been wrongly allocated, this should result in a reasonable approximation of the overall picture. A performance can be seen on YouTube here, and the sheet music can be found on IMSLP here. Hofmeister’s own publishing house is listed under 16 different countries in the Monatsberichte. And indeed with many male composers! It has been suggested that this might have something to do with the British having a more liberal attitude to female performers than many other European nations, although this requires further research. I have used modern country names here to avoid getting into the complexity of the changing countries and borders of nineteenth century Europe.